I am voting for Gunnar Y. for STAR student because he is a really nice person. Gunnar is very nice and helpful. He is funny and helps me if I'm stuck on something on a paper. Lastly, he has very funny jokes. Gunnar has always done what was ben expected of him, he has always done his work, always been kind to other people, and has been a good friend. I believe that Gunnar shows the true spirit of a ranger, he is kind, respectful, honest, helpful and does what needs to be done. Gunnar has been and always will show the leadership that we need. I hope that others can see it that way too. 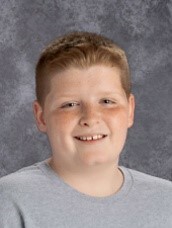 I chose Gunnar Y. because he respects his fellow students and teachers. He is always there to help anyone when they need it most, and is willing to stand up for anyone. Gunnar is very kind and respectful. Also, Gunnar is very helpful and a good student. He never has any problems with students, nor teachers. And he is just overall a good friend and person to be around. Gunnar has been a nice friend for as long as I can remember. Gunnar is always very thoughtful and kind. Gunnar is also very smart. Gunnar is very helpful in everything he does, he will help even if he is not asked. Another reason is that he is respectful to everybody unlike most. The last reason is he is just a really good friend who you can rely on. In conclusion Gunnar should be the star student of the month because he shows everyday that he strives to be a Ranger. Gunnar Y. is a good student, and a nice friend who I believe deserves the STAR. First of all, Gunnar has gotten Principal’s Honor Roll, and it takes a lot of effort to get it. Secondly, when I'm around him he seems to never be mean to me or to others. Finally, Gunnar never disrupts the class, and always pays attention. Thus, Gunnar Y. is my nomination for House 6-2 STAR reward, he deserves it more than I do. Gunnar is a very nice friend. He talks about everybody in a nice way. He has never called anybody names . Also he knows how to handle every situation. Gunnar is very kind to everyone and is a good friend. He helps people when they need help, and he always pays attention in class. I am nominating for Gunnar Y. because he is an all out great guy. When I first came to this school Gunnar started talking to me and just wanted to be friends with me. He helps me to do the right thing. My final reason is he is honest. To conclude Gunnar is an awesome person. Gunnar encompasses all qualities of being a STAR: kind, helpful, respectful, responsible, and honest! HIS is proud to have Gunnar represent our building as our STAR for the month of February!